Charging deep cycle batteries correctly can improve and extend the life of your golf cart battery. If you are a new golf cart owner, you simply plug the charger into your cart and 2-5 seconds later, you will hear it automatically turn on. 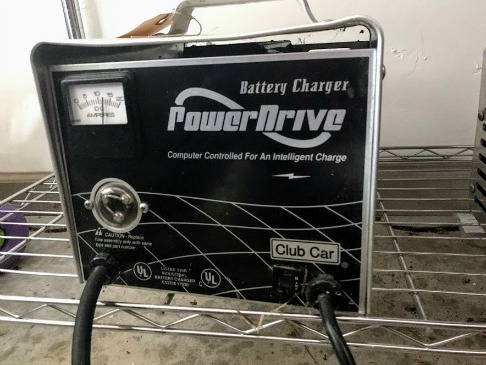 It is important to charge the batteries completely before you use your electric golf cart - especially when it is new. By running the new golf cart until the battery charge is way down, you shorten the life of your new batteries. The charger will turn off automatically when the batteries are fully charged. There is nothing to turn off. Simply unplug the charger from the cart when the charger has shut off. Depending on how much the golf cart batteries are discharged will determine how long it will take to fully recharge them. You can certainly run your batteries down to 80% or so if you are using it for several rounds of golf or for a long trip on your golf cart but this may shorten the life of your batteries. Avoid deep discharging whenever possible. Be sure to charge the batteries fully after every use. When you have a new golf cart or a new set of batteries, they will need to be fully charged around 20-50 times before they've reached their full capacity. Good golf cart battery charging practices can lead to to a longer lifespan. 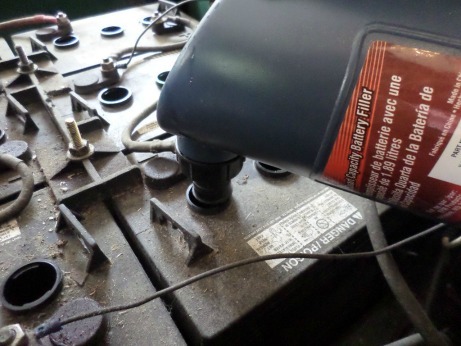 Charging deep cycle batteries needs to be done after every use for optimal care of your batteries. Even if you only use it for 9 minutes or 9 holes. 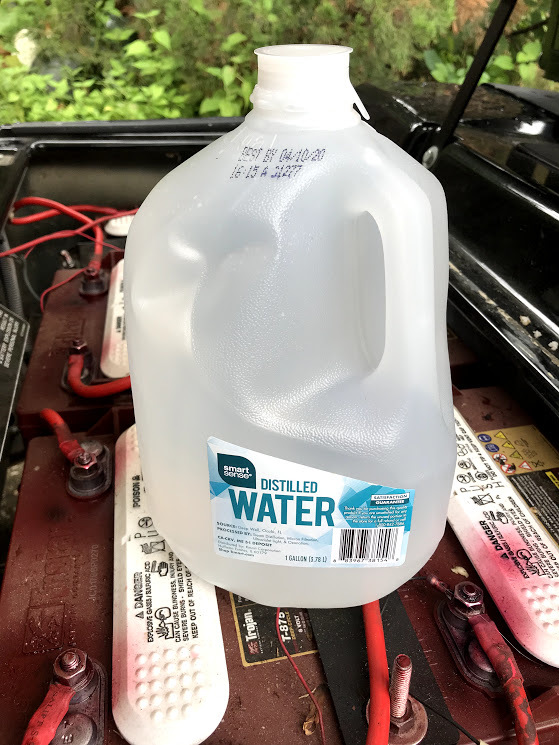 This is especially important for those of you who live in a golf cart community like I do - many times we use our golf cart just for a few minutes each day to go to a neighbors house or to run to a store. The worst thing you can do to your electric golf cart batteries is to let them sit in a hot garage without ever charging them. Avoid running your golf cart on a low charge as this can be very hard on your batteries and can shorten their life span. A few times after 36 holes of golf, my battery charge indicator is flashing, which means, it could die at any moment. This is what you are NOT suppose to do. Also do not plug your golf cart battery into a plug that is shared with a refrigerator or other electric appliance. It can interfere with the consistency of the flow of electricity which also affects the health of your batteries. 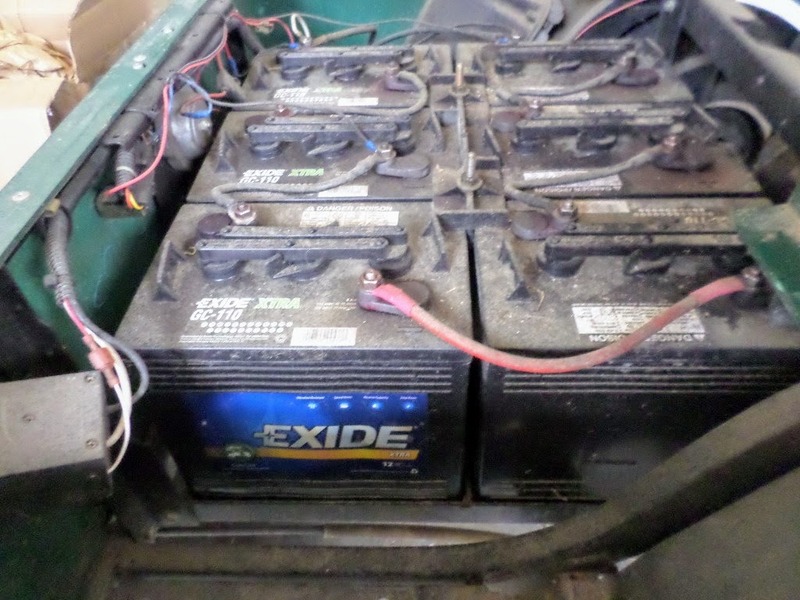 By understanding golf cart batteries you may save yourself some serious money. Because we live in a golf cart community and I love to play golf, our golf cart gets used (and abused) a lot. I have done everything good and bad to my golf cart. The one thing I have not yet done is to run it so long and so far that the cart will no longer run. This can really shorten the life of your batteries and in fact, you risk the possibility that the batteries will not accept the recharge if it is completely discharged. So understand that the deeper the discharge the harder it is on your batteries. 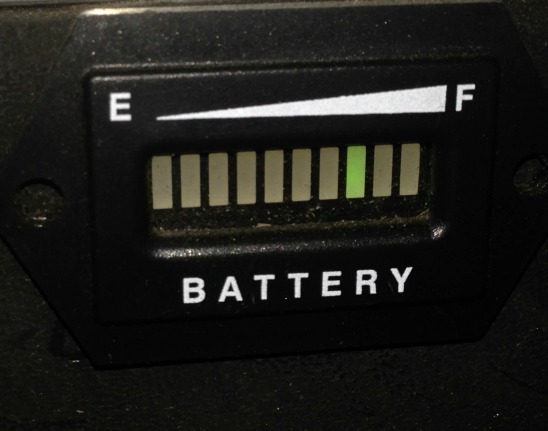 The amount of time it takes when charging deep cycle batteries depends on how much they are used and how old they are. Make it a habit to plug in the charger every evening and let your golf cart batteries recharge over night. 1. Batteries need to be fully charged between uses. Using your golf cart when your batteries aren't fully charged leads to hard sulfation and can affect battery performance and the longevity of your batteries. Make sure your batteries have enough time to complete a charge cycle before using your cart. 2. Be sure to check the water level of your batteries frequently (more often in the summer). 3. Dry batteries are the number one cause of premature failure. Use distilled water rather than tap water. 4. Water your batteries after they are fully charged ... unless there is no water covering the plates. If that's the case then add just enough water to cover the plates. Be sure to use distilled water. If you fill the batteries before you charge them, you risk overfilling. During the charging process the electrolyte level will rise and may bubble out of the cap damaging your frame and garage floor. After fully charging deep cycle batteries, perform the water maintenance program. 5. Batteries need to be kept clean and dry to prevent self discharge. Dirty batteries can cause a trickle of small current that can slowly discharge your batteries. 6. 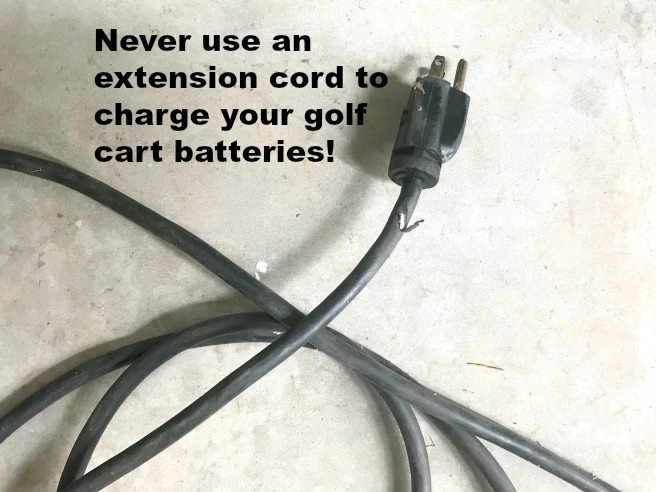 Never use an extension cord to charge your electric golf cart batteries. Doing so can cause a fire. 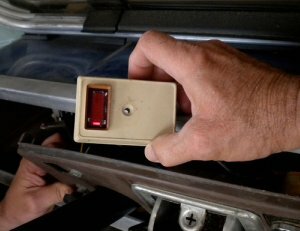 Also keep the garage door open or garage ventilated when charging. Deep cycle batteries generate explosive hydrogen gas. 7. When it comes time to replace your batteries, replace all of them. Do not mix new and used batteries. A little warning if you are finding that your golf cart batteries are not holding their charge as long or as well as they used to, it may be time to get new batteries - Ouch! They keep jumping in price and it will cost you a couple hundred dollars. 8. When you are pulling the battery charger plug from your golf cart, be sure to pull on the actual plug, not the cord. If you repeatedly pull from the cord, which is what my wife does all the time, you can damage the wires inside the plug and pull them loose. If this happens your charge won't work. I have found that after a few years, my batteries take a longer time to charge and don't hold a charge as long as the new batteries. The older they get, the more frequently I check the water levels. 9. 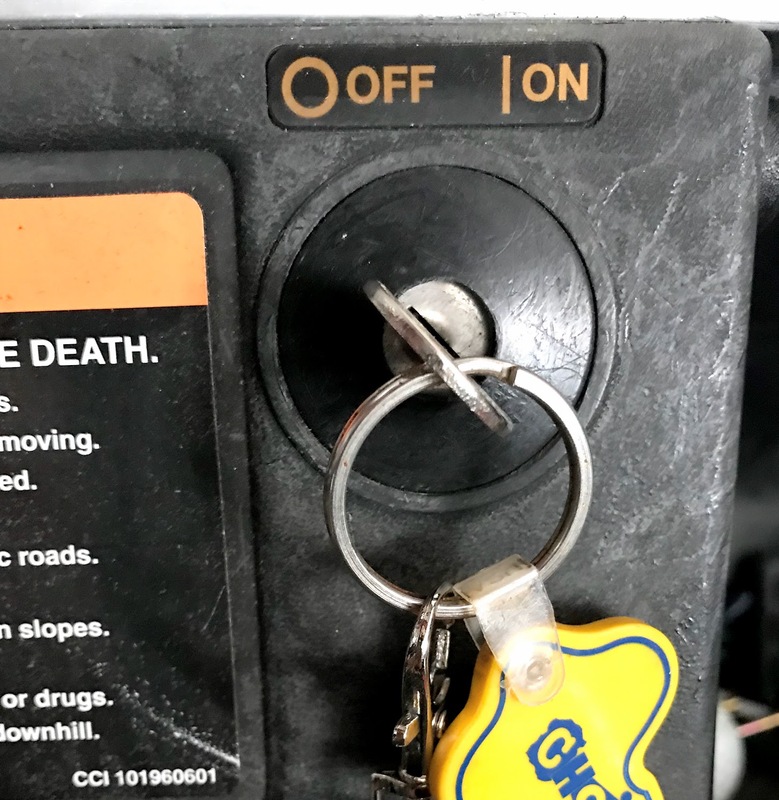 Be sure the the ignition key is in the "off" position. Turn the golf cart ignition key to off and place the cart in neutral before charging your golf cart batteries. Who would drive a golf cart without a charge meter? It would be like driving a car without knowing how much gas is in the tank. You wouldn't think that any golf cart would be without one - but indeed it does happen. I came across a stranded teenager on the golf cart paths who was driving her neighbor's fairly new golf cart. The cart had stopped after she had taken it across town and was heading back home. When I stopped to help her - sure enough there was no meter for her to know how much charge was left on the batteries. To protect your garage floor from the battery acid that spills over invest in a garage mat. 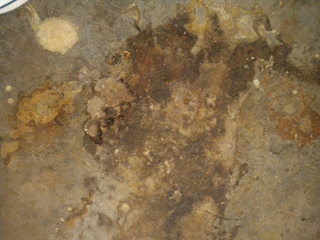 We have lots of stains on our cement from our golf carts and now use a mat to prevent any further staining. Simply place it under your golf cart. This mat measures 5' x 8.5' and will fit under most standard golf carts. If you notice your that your cart is slowing down and doesn't have quite the power it once did, it may not be the batteries. It could be low tire pressure. 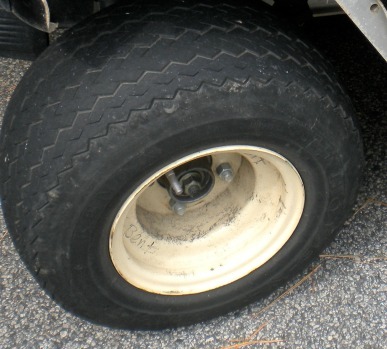 Low tire pressure causes an increased load on deep cycle batteries which will not only slow down the golf cart but also decrease the distance one can go before recharging. Go from Charging Deep Cycle Batteries to Golf Carts Etc.